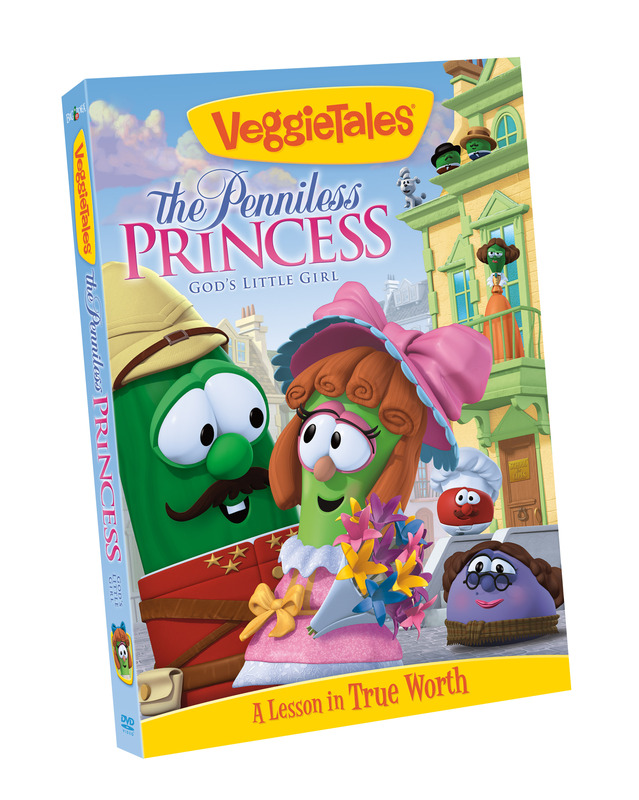 The soon-to-be-released VeggieTales video, The Penniless Princess: God’s Little Girl, is based on the book A Little Princess by Frances Hodgson Burnett. I discovered Burnett’s writing as an adult when searching for good reading material for my daughter, and this book was a favorite. Big Idea puts their own VeggieTales spin onto the original story, but that’s part of what makes it fun. While we expect a movie from Big Idea to include VeggieTales twists, Burnett’s story was actually well represented. Sarah Crewe begins life as the only beloved daughter of a wealthy man. When Captain Crewe goes to war, he leaves his daughter at a London school for girls directed by the ominous Miss Minchin. After Sarah’s father dies, Miss Minchin sells all Sarah’s belongings to pay for her care, and the child becomes a servant in the school. In the VeggieTales version, Sarah’s father reminds her before he leaves that she really belongs to God and will always be God’s little princess. Sarah remembers her father’s words during her deprivation and loneliness and tries to act like a princess by showing kindness to others no matter how she feels. I won’t give away the rest of the story, but it has a satisfying ending. The video handles the father’s death sensitively, so I do not think children will be traumatized by it. Sarah learns to trust God as she recalls all she learned from her father. She also finds solace in the biblical story of Joseph, who started out rich like her and then found himself penniless and in prison. Sarah chooses to express exuberant joy in the midst of her troubles, often in song. She also sings to express her deep feelings. One of my favorite musical surprises was the introduction to the song “No Matter What,” which begins with alternating swishes of a broom and a scrub brush. The story has amusing touches of humor, which adults and older children will especially appreciate. The Silly Song on this video, “Best Friends Forever,” shows two girls texting each other. It’s a bit fast-paced for the non-savvy, but I think children will have fun trying to sing along with it. I noticed only one objectionable element in the video when the character Ermengarde uses the word golly. Most people, even Christians, are unaware that this term originated as a euphemism for God (much like gosh, gee, and jeez). When it comes to honoring God’s name, I prefer to err on the side of caution and reverence. During the wrap up, Larry looks into God’s Word for application and reads Romans 8:39. This verse reminds us that nothing can separate us from God’s love, which is in Jesus Christ. This is the first time the movie mentions Jesus, and I was glad it did. Until then the video seemed to assume that all children belong to God. However, after reaching an age of accountability, we can only belong to God through His Son, Jesus Christ. Each person has to repent of sin and believe the gospel, the good news that Jesus paid for our sins so that we wouldn’t have to. He alone can give us access to God the Father and eternal life. Then the Holy Spirit gives us the power to live better lives. We can’t expect a short video to teach children all they need to know about salvation. This story plants good seeds by helping children understand how much God loves them. It’s up to parents to take what children learn here and help them understand the whole truth of the gospel, that God loved them so much He gave His only Son for them (John 3:16), and then help them apply this truth to their lives. The Penniless Princess is a delightful movie. Children will be inspired to trust God in both good and hard times and show kindness to others “no matter what.” I think you’ll enjoy it. The publisher provided me with a free copy of this product to review. I was not required to write a positive review, nor was I compensated in any other way. The opinions I have expressed in this review are my own. This disclosure is in accordance with the FTC Regulations.